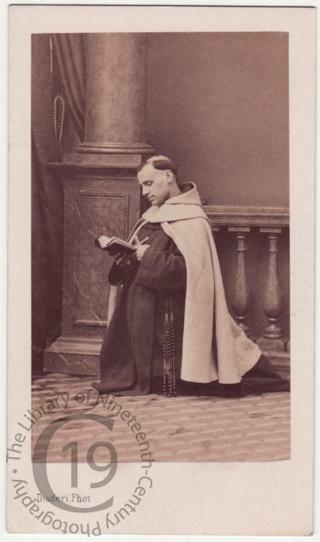 A carte-de-visite portrait Monsignor Bauer (1829-1898), also known as Père Bernard, who in 1867 was appointed one of the Empress Eugénie's confessors. Born Paul Bauer into the Jewish faith at Budapest in Hungary, 'through the Carmelite priest Augustin (whose actual name was Hermann Cohen), Bauer, after an adventurous youth in which he tried all sorts of métiers, including painting and photography, became a convert to Catholicism in Paris and a member of the Carmelite Order, which he, however, left later. He distinguished himself as a pulpit orator, first at Vienna, where he delivered a series of addresses, which were published (1866) under the title "Le Judaïsme Comme Preuve du Christianisme." Eventually he attained to the rank of a bishop. In 1867 he became father confessor to the Empress Eugenie. On Nov. 17, 1869, he delivered the dedicatory address at the opening of the Suez canal. After the downfall of the empire, Bauer exchanged the bishopric for the turf, and became a fancier of race-horses'. [Source: The Jewish Encyclopedia, 1906]. In 1899 Marie-Bernard Bauer broke his vows and married Elisabeth Marie Lévy. He died in Paris at his home in the rue Marbeuf on 14 May 1903 and was buried in Père Lachaise cemetery.